It’s hard to rate how scary this novel is. 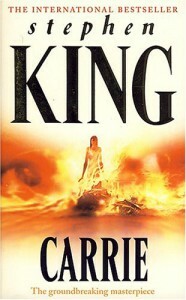 Carrie herself, I do not find scary – she is provoked into using her power, and although there is a bit of overkill when she punishes the town (ha. haha. ha.) she just seems like an unstable, troubled kid with an extraordinary gift. Her mother however, often made me physically cringe with the images King gave me. He uses a unique writing style that shows his skill; the blend of newspaper articles and interviews was very interesting and a brilliant way of drawing the story out whilst still keeping the reader hooked on every word. Another interesting trope of King’s is the way a character’s thoughts can interrupt the narrative.